Garden Spaces have recently completed a garden gym building with integral storage areas. This is a totally bespoke design, designed to sit perfectly within the customers landscaped garden. Garden Spaces customer wanted to create a spacious home gym room with as much headroom as possible. They also wanted to incorporate a storage area within the building – this is becoming a very popular request with garden room buyers and is ideal for storing garden equipment, bikes, etc. At 9.2 meters by 4.5 meters, this is a substantial sized building. Internal walls divide this space into three rooms. Two storage rooms sit at the back of the building. One can be accessed via an internal door from within the main room. The other storage area is accessed via a secret external door. 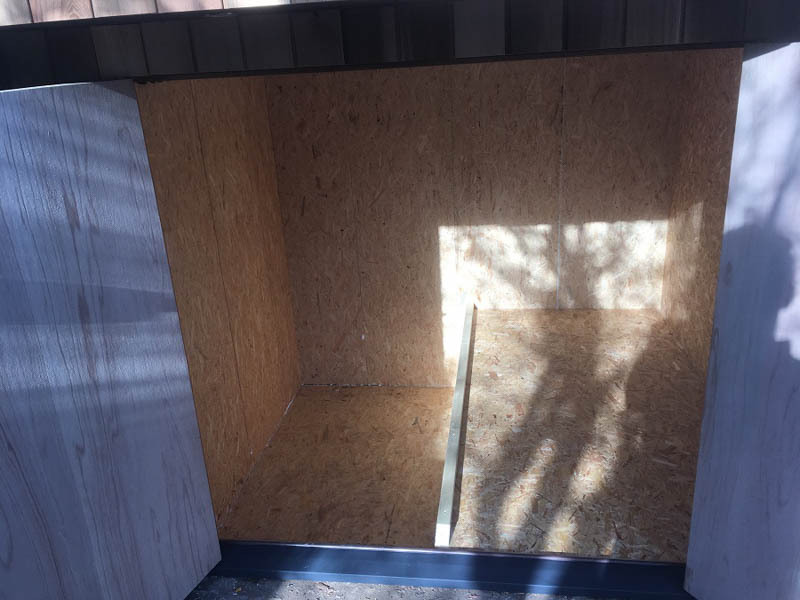 One of the storage rooms has the same high-spec plastered and decorated finish as the main room; the other storage room has a practical OSB finish which is durable and easy to keep clean. A strip light has been fitted, to light the room when needed. The main gym room is flooded with natural light. A clever arrangement of windows on the long side elevation has been positioned to sit at the same level as the raised garden area alongside. Five fixed pane glass panels have been used to create this large section of glazing. Two letterbox style windows have been positioned on the opposite wall, offering both easy ventilation and some top level light. On the front elevation, a 5-leaf set of bi-fold doors has been fitted. As you can see these doors slide to one side, opening up the whole wall onto the garden. A shaped decked area has been created in front of the doors, creating a nice connection between the garden room and the garden itself. The doors and windows are powder coated aluminium with double glazed glazing and multi point locking systems. The doors and windows have an integral blind system to control light and offer privacy. This is a clever system that sits within the glazing and is controlled with a magnetic pulley system. The owners of this gym will be able to control the temperature in the room as they work out, thanks to the inclusion of a Fujitsu climate control system. This is a discreet system that is quiet and efficient. The electrical system within the building is well specified with nine internal and 11 external dimmable LED lights. There are ten double power sockets with all the electrics installed to Part P certification standards. This is a fine example of how Garden Spaces can create a design tailored to your garden and specific needs. To learn more talk to the Garden Spaces team on 0845 387 9 387 or take a look at their website to learn more about their work.